The Christian way of life is not only taught formally but permeates all areas of the curriculum. Prayer is seen as an essential part of school life, to praise God and to put before Him the needs of the children, the school and the community. 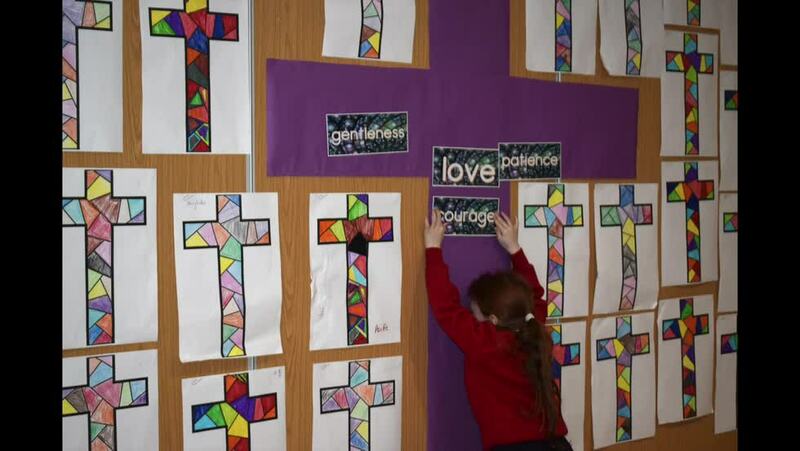 Children are prepared for the reception of the sacraments of Reconciliation, The Eucharist and Confirmation and the sacraments are regularly celebrated in school. This is always a special time for the children and their families. The "Alive O" programme is followed closely throughout the school. This excellent programme builds on the experience of the children. The Wonder of my Being is part of our religious programme and concentrates on the growth and development of the child from within the womb to adolescent. Our religious programmes are the basis of our "Values Education" project, when a different value is taken and emphasised each month. Each month we hold a class assembly on the new value and children are encouraged to show examples of the value in their everyday behaviour. Teachers promote "God's love for me and my love for others." Today marks the start of Catholic Schools Week. Catholic schools will be involved in activities and events throughout the week to celebrate the part God plays in their lives and the lives of others. Holy Cross Girls' takes it duty of being a Catholic school seriously. It is an all inclusive school and welcomes children from other faiths and traditions. The children are at the heart of the school and the wonderful relationships which exist between the Principal, staff, children and parents has created a family unit where everyone feels safe, valued and challenged to be the best that they can be. We celebrate achievement - Girl of the Week, Birthday Girls, Star Readers, Maths Quiz winners, success in exams, 100% attendance, FISCA choir etc. as well as celebrating with the child who writes her first word or the child who jumps her first skip - they are all precious to us. We support fully the children who at some time just need that little extra help to succeed. All children need a little help, a little hope and someone who believes in them and values their talents no matter what they are. They are all our 'GORGEOUS GIRLS'. We work hard to instill in them respect for others and help them to become responsible citizens of the future. We value the support of our parents and work closely with our community, especially our friends in Bradley Manor and Flax Centre as well as the charity organisations which we help, it is a community which has given us tremendous support through good times and indeed some very bad times. Thank you. Prayer is an important part of our school life and throughout Catholic Schools Week we will pray to God for you all and ask God for his continual blessings on our school, our children, our staff, our parents, our families and our community. Everything we have comes from God and we should treasure it. P1 will start the week with a lovely assembly on CREATION at 9.15am Monday morning in school. Our GRANDPARENTS DAY will be celebrated on Wednesday in school at 10.30am. You are all very welcome to come along to these events or even just call in to the school during the week to look at the work done by the children during this special week. The highlight of our year for the younger children and their parents is our annual Nativity play.